Sports massage and deep soft tissue Massage is a safe and effective form of treatment. Massage works incredibly well for stiff and overtrained muscles. The more in-depth style of sports massage will almost certainly have a lasting and positive effect on your body. Deep tissue style massages leave you feeling invigorated, relaxed and more flexible. Studies show that Sports Massage has many diverse benefits. It can reduce the risk of injuries, aids blood flow lengthens shortened muscles and helps connect mind to body links by stimulating the nerve receptors and releasing tensions. All of our sports massage practitioners are experienced and have degree level training. Professional Massage in Hatfield is one of the cornerstone treatments at the Practice. Deep Soft Tissue Massage is not only for sporty people and sports injuries. Many people drive or sit at a computer all day. Hatfield sports massage and deep tissue massage could be just what the body needs. Massage is great for muscle soreness and specific injuries. Sports massage also increases blood flow through the tissues can improve the recovery process allowing the athlete to train more effectively and safely. Above all sports massage increases the patients feel and understanding of the deep muscle tissue. Invaluable in respect to sensing how your body feels. Advice can be given on specific stretching, training, and equipment to help improve training and performance. Deep soft tissue massage will help specific injuries to heal. The sports injury specialist can provide a biomechanical exam and treatment. If the issue is involved, does not settle or does not resolve, you should also seek the advice of Physiotherapy or Osteopath at the Practice. Professional help at The Practice is always available by calling 01707 888229 and ask to speak to one of the practitioners. Its essential know that some injuries need immobilisation. Acupuncture can help with pain relief. Deep Tissue Massage is safe and effective; you will feel fantastic, flexible and relaxed after the treatment. In general other forms of massage such as holistic therapy does not diagnose (although it may indeed help). Occasionally its a better idea to visit one of our Osteopaths or Physiotherapists as they provide detailed consultations, diagnosis, and treatments. Call us up we are always happy to help. Professional Sports Massage will focus on the areas you need treating most. Soft tissue massage is useful for tight hamstrings, thigh muscles, low back or shoulders, and neck. Sports massage helps enhance flexibility by elongating muscle length and eases tensions. Massage helps by releasing stiff shoulder, hip, and spinal joints by easing tensions and improving blood flow. Massage tends to reduce soreness after intense or repetitive training. Preparation-wise for many Sports massage reduces the anxiety of athletic competition. Hatfield Practice Sports Massage sessions are an essential part of our treatment programme. Sports Massage | Deep tissue massage is often part of a tension and flexibility |management programme. Excellent for managing pain, muscle tensions and stiffness. Massage can help spine and joint rehabilitation after injury or training. The Practice massage team uniquely include the Osteopaths and Physiotherapists at the Practice. Massage practitioners are hands-on, highly trained and time served. Massage Patients return year in and year out as treatment is effective and works very well. Some people come back to relax or have a treatment MOT. Others are following a demanding training programme and want to help reduce the risk of injury and improve performance. Sports massage can have some significant benefits. Your professional Sports Massage starts with a detailed medical case history. The Treatment provided alongside the medical history and a comprehensive examination. History and testing is useful because it helps to provide a clear picture of your past experiences, injuries, and conditions. Sports massage treatment typically involves a more in-depth style of soft tissue massage using both hands and arms for deeper muscles. The Masseur is trained to observe and treat the restricted/injured areas. First of all the massuse will start gently to work along particular muscles, connective tissue and nerve pathways. Massage relaxes and reinvigorates and helps the body repair stiff muscles and ease restrictions. Sports, deep tissue massage has many documented benefits. Deep soft tissue massage tends to release muscular reflexes, trigger points and relieves the pain. Lifestyle can cause stiffness through muscular and soft tissue shortening. As we age, habits can reduce our natural range of movement that can lead to restricted muscles and deep muscle pain. Massage treatment can provide a fantastic sense of lightness, freedom of movement and may help to reduce injuries. Massage which ones best for you? If you are uncertain about what’s best for you why not call reception on 01707 888229 and they will do their best to explain. With 30 years of clinical experience, you can’t go far wrong. Hatfield But for sports people a good sports masseur is invaluable to help their sporting injuries and performance. Sports Massage therapy is a form of deep soft tissue manipulation that uses several specific techniques to above all treat physically active individuals. Anyone involved in heavy-duty physical activities may be more vulnerable to injury because of the stresses placed on their body by exertion. Sports massage at the Hatfield Practice can relieve niggling aches and pains before they develop more serious overuse injuries. It can also be great for post-event relaxation and recovery and help to reduce stress, tension, and fatigue. 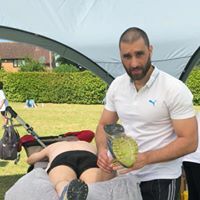 Sports massage is generally used to provide rehabilitation from soft tissue injury, to maintain muscular conditioning and joint flexibility for competition to maximise athletic potential. Overtraining may cause myofascial shortening, i.e., restrictions in your body’s contractile (muscle) and non-contractile supportive (fascia) connective tissues. Treatment can help keep your body flexible, aid your performance, and assist you in rehabilitation from injuries. Assisting in the prevention of injuries sports massage can be used to help you prepare for physical activity. Treatment can aid in your recovery after physical exertion or after competition or training. Although, as its name implies, Sports massage is a form more geared towards the athlete, it is equally effective in dealing with the problems caused by heavy work and the stresses of everyday living. As a result anyone who plays a sport or is involved in hard physical effort can be injured. The most vulnerable are children and adolescents, middle-aged athletes and women. More and more sports and fitness enthusiasts include massage as a part of their conditioning programmes. Deep Tissue Massage is not just for the professional athletes. Its helpful for everyone who is feeling stiff or sore. When you look at massage rather than as a health benefit, then it is not a luxury. Deep tissue massage as part of the regular healthy living programmes makes long-term sense. Massage may help reduce swelling after injury or training. Indeed massage will loosen tired, stiff muscles, help maintain flexibility, promote circulation. Relaxed muscles support good blood supply which helps to provide more oxygen to the muscle. Deep soft tissue massage will help speed up recovery time and alleviate any soreness. Massage treatments help to remove the waste products of sustained training. Athletes often use deep tissue massage as part of their training programme. In fact, some athletes have attributed Sports Massage as a primary reason for their performances and longevity. For the athlete, massage can help improve performance, increase endurance and may lower fatigue levels. By reducing fatigue, athletes can train better with longer and more effective workouts. Below are descriptions of the more common forms of deep tissue massage.